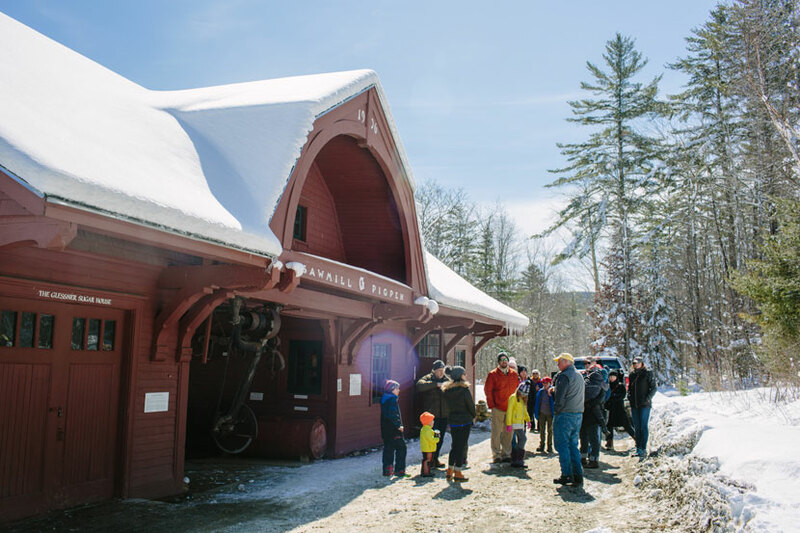 The complete maple experience at the Rocks includes a horse-drawn wagon ride to the sugar house. The fence in the background surrounds the foundation of the Tool Building that burned to the ground on Feb. 13, 2019. Fortunately, the fire did not spread to the sugar house and maple museum. All photos by Emily Lord/Forest Society. If you’re a repeat visitor to the Forest Society’s Rocks Forest Reservation in Bethlehem, it is immediately evident as you crest the driveway that something is different. The 1903 Tool Building, a 3½-story barn that housed our offices and program center is gone, the victim of a fire that broke out Feb. 13. Gone too is the former Electric Plant that served as a gift shop. Only the chimney remained of the Tool Building at The Rocks the day after the Feb. 13 fire. The sugar house and museum are housed in a different historic building that was also part of the Glessner family estate — a “sawmill/pigpen” where cordwood was cut to length and the resulting sawdust was used to make the future bacon comfortable. That building was restored a few years ago to become the focus of our maple programs. The heart of the Maple Experience at The Rocks is the Glessner Sugar House and the Maple Museum, which are housed in the restored “Sawmill/Pigpen” building. Like most of our programming at the Rocks (the Forest Society’s North Country Conservation and Education Center), learning about something related to forests or farming is part of the fun. 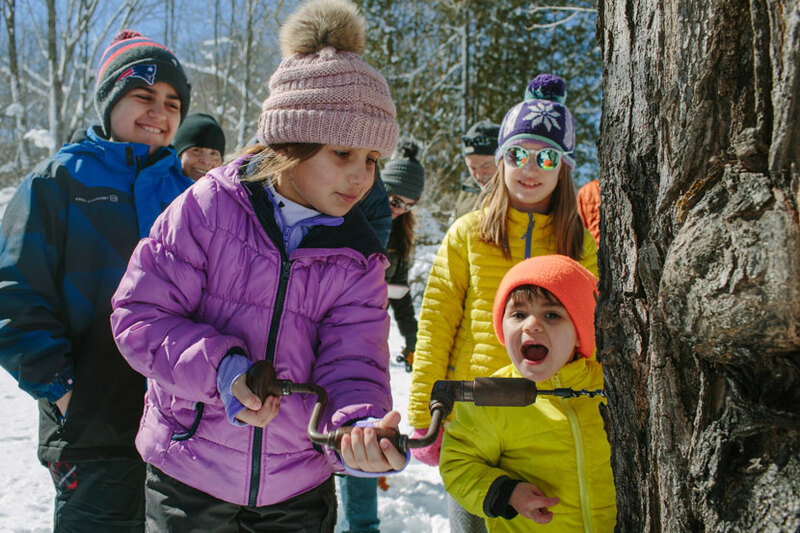 The maple program is a hands-on experience that lets visitors figure out how sugaring works — from identifying sugar maple trees, tapping and collecting sap, to boiling and bottling the sweet finished product. Tasting is included, of course. A young visitor gets a chance to try tapping a sugar maple tree that is many years her senior as part of the maple experience last weekend at the Rocks. The final maple tours of the season will be offered at the Rocks today and next Saturday, April 6, from 10 a.m. to 4 p.m. Reservations are recommended. Call 444-6228 or email info@therocks.org. At the Forest Society, the outpouring of support and expressions of concern from so many people following the fire has energized us to dive into the process of figuring out how to become operational again. We are committed to the Rocks’ Christmas tree operation and are making arrangements to be able to host our many cut-your-own tree customers in November and December. We are also thinking about how we can best replace what was lost. We’ll need to operate the Christmas Tree farm (you have to plant, grow and shear the trees before customers can cut their own! ), provide office and workshop space for staff, public restrooms and classroom space. We’re engaging people in the community to help us consider the options. Rocks volunteer Howard Tewksbury shows a new generation how to distinguish a sugar maple tree. In the meantime, we hope to continue our usual outdoor programming including the maple tours. And if you want extra incentive to make the trek to Bethlehem, the eighth annual Maple Dinner — usually held in the Tool Building — will be at the Maplewood Country Club on April 6 and catered by Franconia’s Chef Joe. The deadline to make a reservation is 4pm on Monday, April 1. If you can't make it to the dinner, but would like to help, donate today to the Rocks Fire Fund. Jack Savage is the Executive Editor of Forest Notes, the quarterly magazine of the Society for the Protection of New Hampshire Forests. He can be reached at jsavage@forestsociety.org.